He is showing this look, like a trance; the eyes are underneath the lids, rolled back. Having these frogs come out, too – frogs were the shaman’s messengers. Frogs appear often on shamanic art because they were imagined as primordial, partly human creatures that retained supernatural power from early times. They lived in the dark before Raven brought the sun, and they made fun of the great trickster; in anger he caused the North Wind to blow the frogs away and freeze them onto rocks. 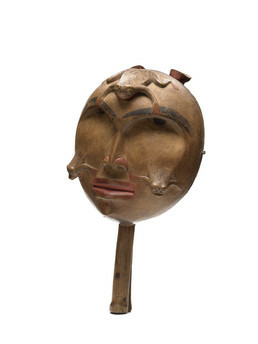 This shaman’s rattle shows frogs that appear with the rain, springing from the eyes of South Wind, who brings rain and desires the world to be green as in spring. The back of the rattle shows the wind’s arms, legs, and body.